This combination of fruitful exchanges and supportive tools makes that all Working Group meetings are productive, most of the time. Unconferences too. In this week, the great moment where everyone join together is the actual Technical Plenary on Wednesday. Instead of having long boring presentation for its general assembly, the W3C team has decided since last year to make that day BarCamp style. Can you imagine that ? 480 people attending this meeting, coming from all around the world, with no pre-provisioned agenda. Just the promise that there will be great exchanges. And it works ! Results of discussions is publicly available here. 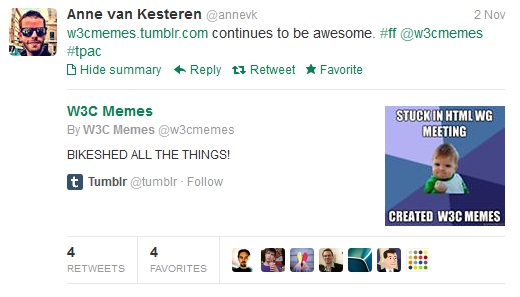 Fun.W3C is also fun and freedom. Werewolf game, dancing show, art and tatoo. 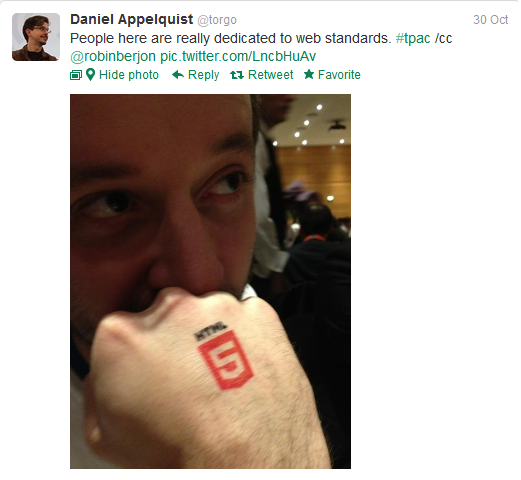 Hope you now all understand why TPAC and W3C are just great framework to work!